Former White House press secretary Scott McClellan is making the news show rounds to discuss his new book about the Bush administration's use of propaganda to promote the war against Iraq and its state of denial during the Hurricane Katrina disaster, among other things. He's also defending himself from personal attacks from the administration he once served, which -- apparently unable to challenge the facts of his book -- has sought to portray him as a "disgruntled employee" and likened him to a "left-wing blogger." In our report on the book earlier this week, we mentioned that McClellan was the scion of a prominent political family from Texas. It turns out that shocking tell-alls also run in the family. McClellan's father, Barr McClellan, is a former attorney in the Lyndon Johnson administration and author of Blood, Money & Power: How L.B.J. Killed J.F.K. 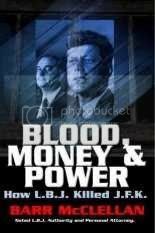 This controversial 2003 bestseller puts forth the theory that Johnson and powerful Texas attorney Edward Clark were involved in the planning and coverup of the Kennedy assassination. Barr McClellan alleges that Kennedy's murder was financed by oil millionaires to prevent the lowering of the oil depletion allowance, a key tax deduction for petroleum producers. The tax break was eventually scaled back by the Nixon administration. Top 5 of 2011 - #4: Who's attacking climate scientists?